You are currently browsing the tag archive for the ‘artistic process’ tag. As with all my work, I’m always bound on a journey with many surprises. I’m not a quick painter, by any stretch. It almost always takes a while for a story to unwind itself in the layers of water, ink and pastel. I step forward. I step back. I work on several paintings at once in order to keep the hum going, so when one piece needs to be left for a while, I can move to another painted narrative in-process. Each time I work, I’m encountering a great amount of puzzling, miring at times, and intense learning. Because of how varied this last year has been in my life, I find no end of ideas that I want to express. Below is the new work, We Speak Our Fossil Alive, 2017, watercolor, ink and pastel, 20 1/8″ x 19 1/16″. On another far more pressing note… it is my hope that we allow equality to stand firmly at the helm of our hearts. May we be in solidarity with those who suffer injustice and whose rights are threatened in these strange political times. Never has it been more important to speak and act, in addition to feeling our convictions to support unity in America. This is why I march. It’s why I say “resist with love”. Peace to all of you! Two New paintings. Diviners. The Final Acceptance…. Happy new year to you all! I am pleased to share two new paintings, mixed media works created in watercolor, ink and pastel. They both contain very abstract qualities, characters and are… like my other paintings, very emotional. It’s been an extremely first wet winter season in the PNW for me. Record-breaking, in fact. What an induction, let me tell you. There is always water clinging to ferns and filling the bird baths. The skies are blanketed in gray. Though it’s enticing to only remain cozy inside by the wood stove or behind insulatory windows, it’s important to go adventuring outside into nature and let those subtle and powerful biophilic forces rejuvenate the spirit. There are many, many ecosystems I know very little about here, having recently moved in September. So I’m educating myself as I go. Hearty duck boots (circa 1991) and fingerless mittens help me go warmly sloshing around. Even on the wettest day, I find it newly feasible to zip up my raincoat and go down to the beach. The forest trails are dense and padded down in a mulch of wet leaves and slick soil. New environments and geography inform new adaptations, both aesthetic and in the mind. This is the middle of the dark Seattle area season, no doubt about it. I’m not acclimated to it yet, but I’m letting it in and feeling. Work in progress, watercolor, ink and pastel. How I’ve looked forward to the announcement of Pausal’s new limited-edition vinyl album release, Along the Mantic Spring.Well, it’s almost here! The album will begin shipping May 6, 2014, but can now be pre-ordered at http://infraction.bandcamp.com/album/along-the-mantic-spring. 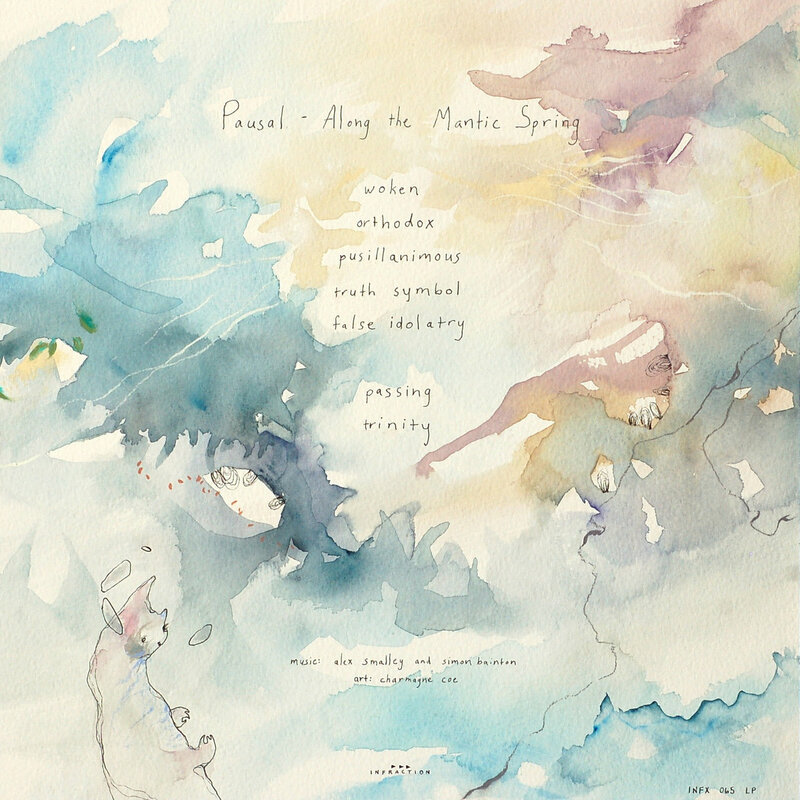 Pausal is the ambient music collaboration of Simon Bainton and Alex Smalley. Please go listen to audio samples at the link. It is otherworldly music. And utterly beautiful. 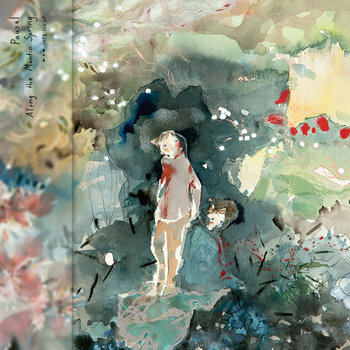 The title of the album was taken from the title of my painting used for the front panel. The album is gate-fold, or four panels. I created several interlaced ink drawings for the two interiors. They are figurative (human and beast), intuitive, magical, mythical…. Here are some pictures of those drawings laid out. As Pausal’s music filled my studio, it was completely effortless to find inspiration. I’ll share a bit about the title and coinciding painting used for the front panel. Along the Mantic Spring was composed, as usual, starting with a feeling, as opposed to thought-out, stringent imagery. I sensed I would be conveying something sacred. 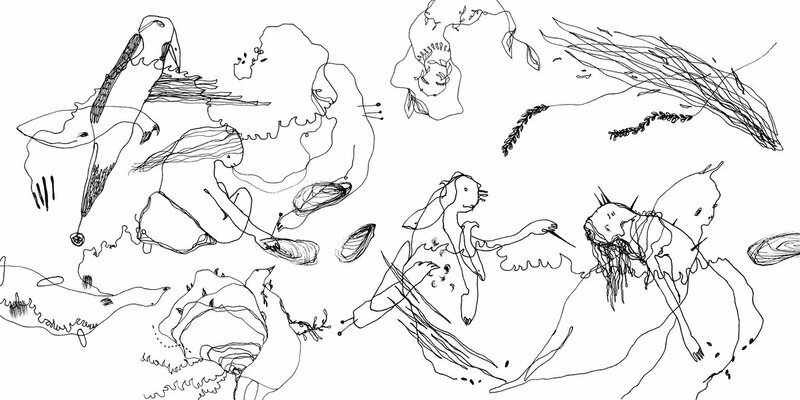 Soon, the figures arrived and the shapes and patterns coalesced. When I paint, there is always constant tension and resolve, a back and forth external/internal dialogue; I am being communicated with and am communicating to. I react to the combination of colors, textures, patterns as much as having an effect on them. All of this, in turn, inter-plays with my current experiences, even the very music that is playing. Sometimes the title will come to me before a painting starts. Sometimes months before. But in this case, I named it afterward. When I finished the work, I did not know the full story of what I had painted but it was obvious that the figures were involved with one another and also with the elements around them. So I went searching for a name and the plot of the story. It started with a word,”grotto”. Soon I was reading about oracles and prayer places…. I have a keen interest in anything ceremonial, anthropological and mythological . It’s comforting to read about scientific adaptation, laws and phenomena, but so to is learning about the ignition of, the migration and cultural borrowing of spiritual and philosophical ideas that have gotten us to this point. We’ve always been grappling with physical mortality, but also with our soulishness. We’ve built temples, etched cave walls, held hands as we stood in close circles and watched the stars to intuit our purpose, be it in love or hunting or war. I was fascinated to read again about the oracle at Delphi and the mantic, message-bearing spring. It struck a note. This idea of communing with gods, with each other and with nature resonated with some of my own experiences. Also, certain phraseology from my charismatic religion of youth, such as”living waters” and “the spirit moved on the face of the water”, came back to me in a delightfully fresh way. It hit home. Communing with one another and touching nature binds us together. It sets certain truths free. As you can see on other panels, the theme continued on and story kept building. I am even still finding out what the story is all about! When I spoke of the title concept to Alex and Simon, we discovered an uncanny similarity of ideas regarding communication. We all agreed that the painting title would also be a great album title too. I will always be deeply honored and thankful to have had this experience and to have worked with such gracious musicians who were open to an organic flow in creativity. Below is the back panel with hand-lettered the titles, credits, music label and other information.